Grape cultivation stretches back over 6000 years and Alexandra the Great, passing through here in 327 BC, made his mark on wine culture. In the 7th century, Islam became dominant and alcohol was forbidden so grapes were eaten as fresh fruit or processed into raisins. 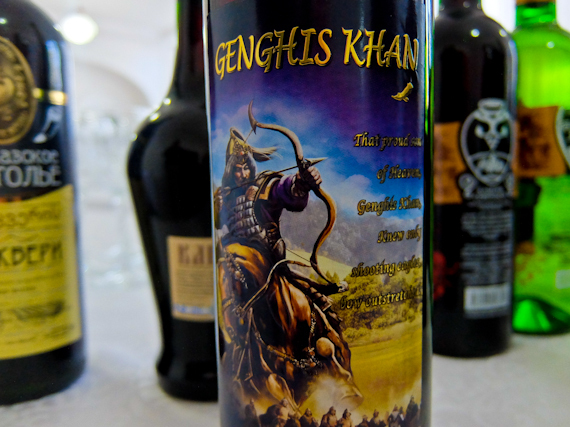 Genghis Khan and his Mongol hordes ironically spurred a resurgence in wine production and Marco Polo, in the 13th century, saw large vineyards, and remarked on the quality of the wine. With the collapse of the city civilisations of Bukhara and Samarkand, wine-making fizzled out. It only revived when the Caspian railway brought Russian entrepreneurs who planted grape varieties from Georgia, Azerbaijan and Europe. One of their first jobs was to make sweet wine for the Russian army, concentrating on quantity rather than quality. After the revolution it was another Russian, Mikhail Khovrenko, who developed the Uzbek wine industry, producing prize winning sweet wines. Only recently have dry wines been produced, mainly using grape varieties we’re familiar with – Riesling, Malbec, Pinot Noir and, of course, Cabernet Sauvignon. My tour starts in the historic city of Bukhara at Shohrud winery. Temperatures here are extreme, rising to 45C in summer but sinking to -25C in January. 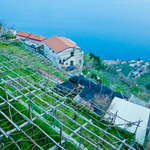 The vines have to be covered with branches and earth in the winter to protect them from frost. Because there’s so much sunshine, it’s difficult to produce dry wines so Kagor, a red dessert wine, is one of their main products. They’re still harvesting when I visit, and I get to taste the wine straight out of the tank. At this stage it’s not overly sweet and goes well with the kebabs they grill on the fire. 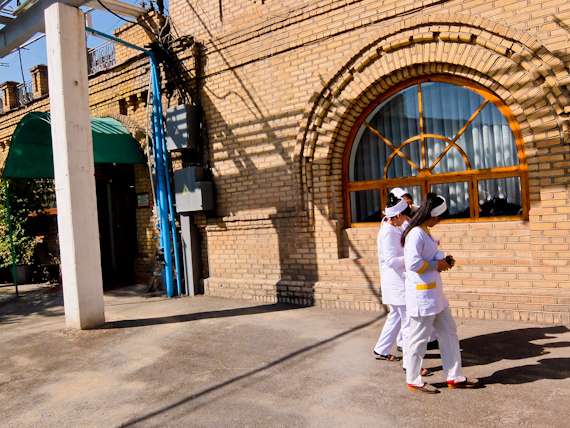 Next I take the train to Samarkand and arrive at Khovrenko, the second oldest winery in the country. Russian merchant, Dmitri Filatov set this up in 1868 and, after great success, the revolution in 1917 forced him to flee the country. 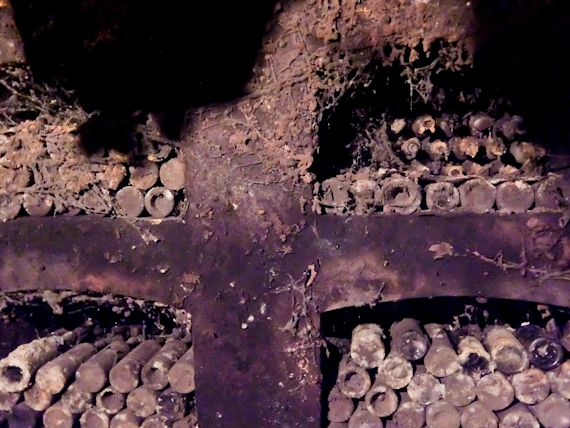 He hid his best wines in a walled up cellar which wasn’t discovered until the 1960’s. Normally only presidents and priests get to taste them but I can’t refuse an invitation. There’s a 1940 Kagor, still very smooth, and a 1938 blend of Rkatsiteli and Muscat, almost like an ice wine and definitely very special. I’m surrounded by thousands of bottles covered in the dust of time and wonder what other hidden gems are here. Their recent production includes Rkatsiteli, Saperavi, Kagor, Aleatico and a reasonable Cabernet Sauvignon from 2013. They’re open to the public and you can also try their cognac and vodka. Next to the tasting room is a small museum with labels from some of their first bottles and a collection of wine related archaeological finds including various earthenware jars. 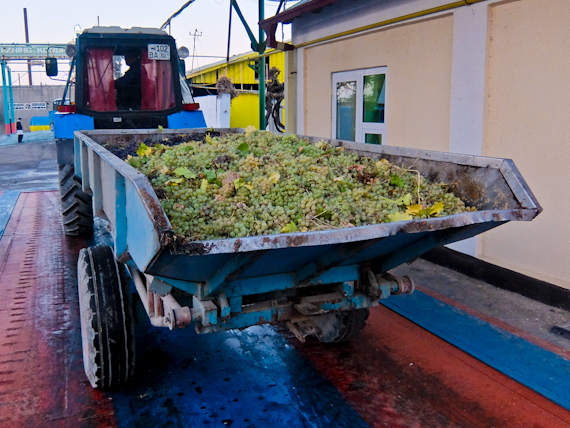 In the late afternoon I travel to Bagizagan Winery, just outside the city, where tractors are delivering trailer loads of grapes to be processed. Aziz Kazimov took over the company from his father in 2000 when their main business was supplying wine in bulk to Russia. 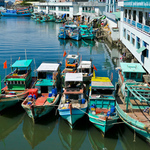 In 2003 they started bottling their own and began to explore other export markets. 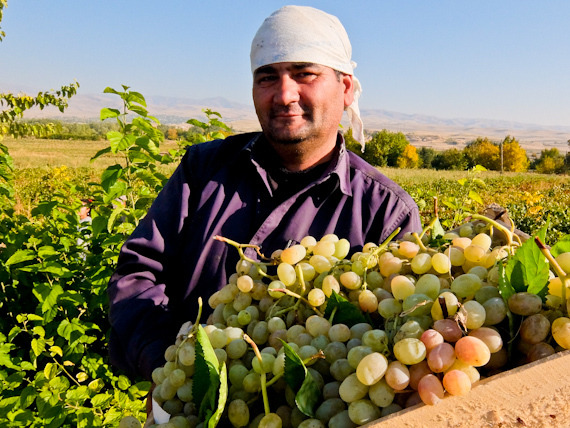 90% of their production is dry wines and they’re now the second biggest producer of these in Uzbekistan. I try a 2016 dry white made from the Georgian Rkatsiteli grape which is eminently drinkable. I prefer it to their 2010 reserve, aged in Russian oak for three months. Their 2016 red Saperavi, also Georgian, is pretty good too, better for me than their 2010 reserve, which has spent 6 months in oak. My favourite is their 2009 Merlot, full bodied, yet with only 11% alcohol. In general Uzbek wines hover around the 12% alcohol mark, something that is apparently determined by the climate. It’s back on the high speed train again, which whisks me back to the capital in two hours. I’ve a tasting at the Tashkentvino winery, the oldest and largest in the country, set up by a Russian, I.I. Pervushin in 1867. It’s a huge complex, reminiscent of soviet times, with its employees wandering around in white coats. Here they process around 50,000 tons of grapes, around 60 million bottles, plus they export 20,000 hectolitres of bulk wine to Russia. 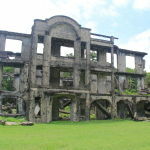 My final visit takes me 60km east to Chateau Hamkor, in the Parkent countryside. It was founded in 1992 and was the first 100% private winery. It also only produces wine, unlike its competitors who have cognac and vodka production. Their 250 hectares are planted with Pinot Noir, Riesling, Cabernet Sauvignon, Merlot, Chardonnay and Shiraz as well as Saperavi, Bayan Shirei and Muscat. Unfortunately I don’t get to taste any of their finished wines, as they tell me they’ve all been sold. Instead it’s a selection of their new wines from the 2017 tanks. The Riesling is cloudy, still undergoing fermentation, but their Muscat Alexandre is already perfectly drinkable. There’s a Cabernet Sauvignon with classic berry fruits and a promising Pinot Noir. It appears that they’re taking their wine making seriously here and there are plans to provide tourist lunches with tutored tastings. When I’ve tried Uzbekistan wines in the past, I haven’t been terribly impressed. The bottles that get out of the country are usually dessert wines, often thick and cloyingly sweet. However on home territory I begin to appreciate their quality of these and their dry wines are now showing great potential. You’ll be hard pressed to find these in the UK so the only way to taste them is to get out to Uzbekistan. 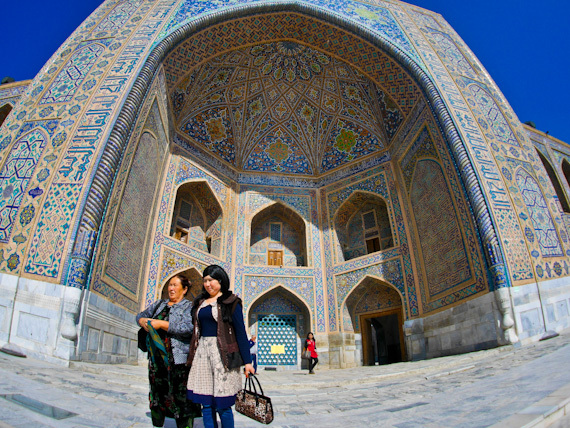 Oh, and the historical sites in Bukhara and Samarkand are pretty impressive too. 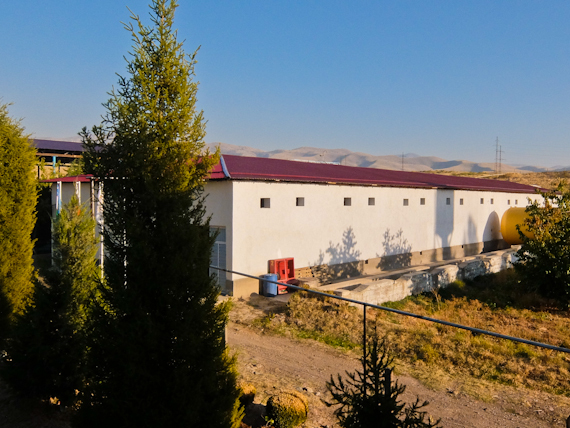 Both the Khovrenko winery, in Samarkand and Chateau Hamkor, outside Tashkent, offer tastings. Uzvinosanoat has information about wines in Uzbekistan. 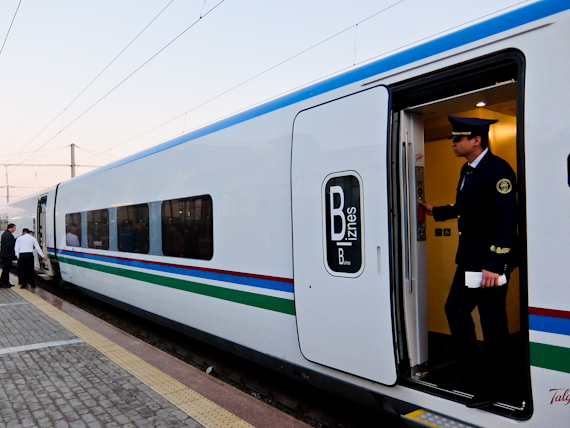 Uzbek Railways new high speed trains connect Tashkent, Samarkand and Bukhara. The Bradt Guide to Uzbekistan is packed with useful information. 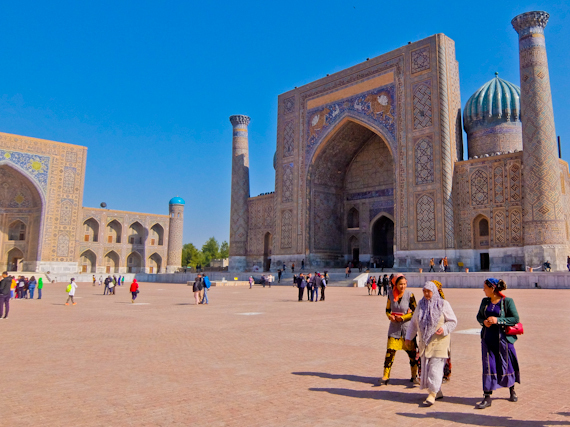 Uzbekistan Airways flies twice weekly from London Heathrow direct to Tashkent.